This case study is part of a series on newer competency-based degree programs that have been emerging in recent years. The case studies are prepared by the Council for Adult and Experiential Learning (CAEL) with funding from Lumina Foundation. 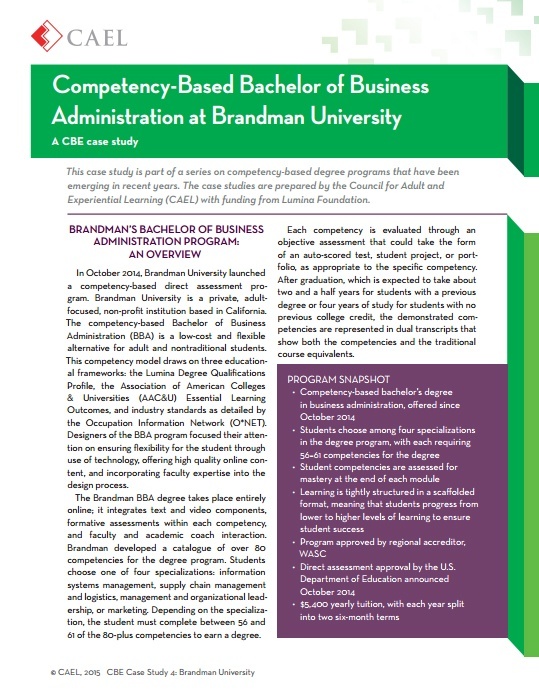 In October 2014, Brandman University launched a competency-based direct assessment program. Brandman University is a private, adult-focused, non-profit institution based in California. The competency-based Bachelor of Business Administration (BBA) is a low-cost and flexible alternative for adult and nontraditional students. Download this case study to learn more.